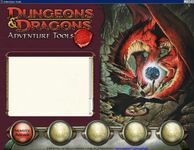 D&D Adventure Tools is a suite of tools designed to make adventure building easy and fun. The D&D Adventure Tools begins with the D&D Monster Builder (currently available to subscribers in its Beta version), with other modules to be added later. The D&D Monster Builder Beta lets you browse over 2,500 official D&D monsters and paste them into your documents. You can take an existing monster from any D&D rulebook or online article and customize it for your own campaign, including changing its statistics, increasing its level and role, replacing powers, and adding new ones. You can also create new monsters and auto-calculate their statistics based on the choices you make.